Hi loves! Oh my gosh, today is SUCH a fun and special edition of our monthly Paint All The Nails challenge. We are doing a Secret Santa, but instead of sending each others gifts, we were all assigned a group member to honor by creating nail art inspired by that person! I was so anxious to find out my Secret Santa and to choose a look I wanted to recreate, but I think I succeeded ^^! Read more to find out who my Secret Santa is ;-). My Secret Santa is Emily Shupe from Nail Polish Society! Emily is such a kind person and while she might not have been as actively blogging lately as she'd like, she has a darn good (and cute!) reason since she just had a beautiful baby daughter. 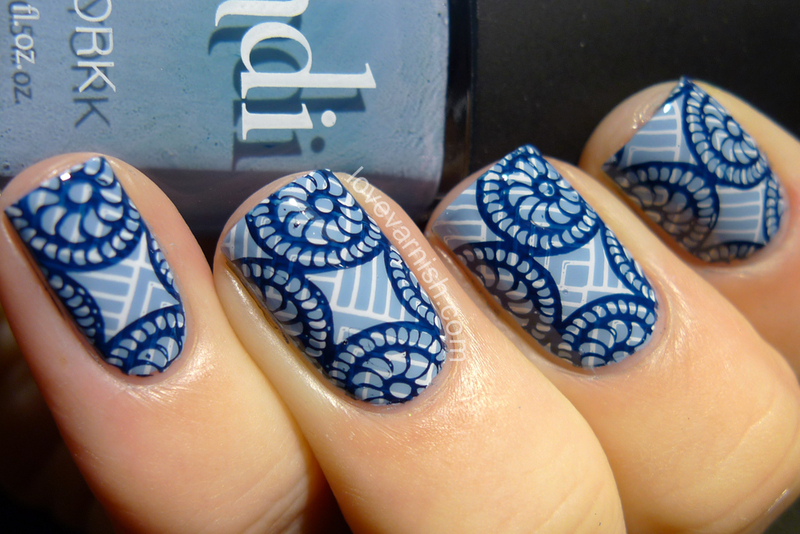 I really love Emily's blog as she has gorgeous nails and great sense of style with her nail art. For my particular look I chose her Double Stamp nails from one of our previous challenges. There is something so mesmerizing about the combination of patterns, I never attempted a look like this before and it felt like the perfect moment to do so! Emily's look features a muted blue grey base, but I didn't have anything that was close enough in my opinion so I went with a slightly different color scheme. My base is a creamy pale blue from Bondi called Blue Skies. 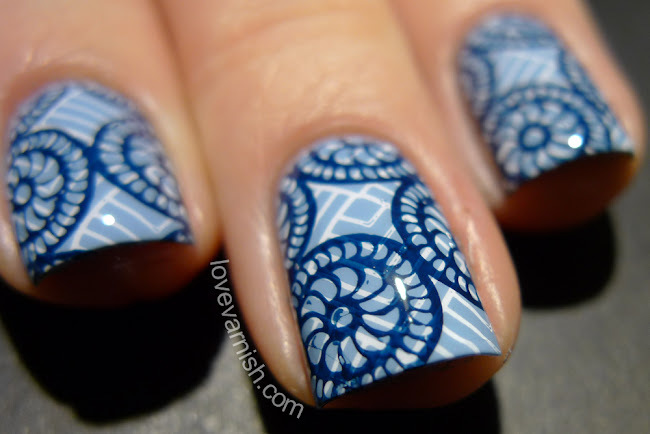 I stamped using a white and a dark blue shade. The stamping images Emily used also don't match with mine for a 100%, but I still think the overall feeling is quite similar, don't you think? We both used MoYou London Fashionista 04, but instead of using MoYou London Suki 06 for the second round, I went with MoYou London Suki 05. Overall, I think my look compliments her initial design very well. I am happy to have found such a wonderful group of nail bloggers that inspire me to try new techniques. I'm very thankful for all of the girls! Do you think my design does justice to Emily's original look? Tell me in the comments!